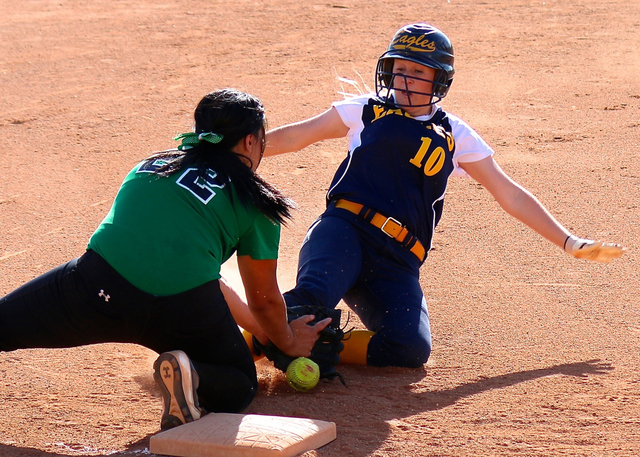 The Lady Eagles softball team is halfway through the season, with a 12-2 overall and 5-0 in league play record. Boulder City’s only two losses of the season were to Yuma (2-0) on March 12 and Faith Lutheran (8-0) on March 14, both in the Colorado River Invitational. Its biggest win of the season so far was over Desert Pines (20-1) on March 16. Before the start of spring break, the Lady Eagles played two road games: against Southeast Career and Technical Academy on March 26 and against El Dorado on Friday. Against Tech, Boulder City won 10-1. Freshman Jerra Hinson scored two runs with one hit and one run batted in. Pitcher Jordan Moorhead pitched a solid seven innings, with eight strikeouts, allowing only five hits. The Lady Eagles also won against El Dorado, 14-4. Both Lily Osman and Moorhead scored three runs, with two hits, and had one run batted in. Moorhead pitched another complete game, with four strikeouts. Next for Boulder City is today’s game against the Imperial Lions at the Spring Jamboree at Majestic Park in Las Vegas. 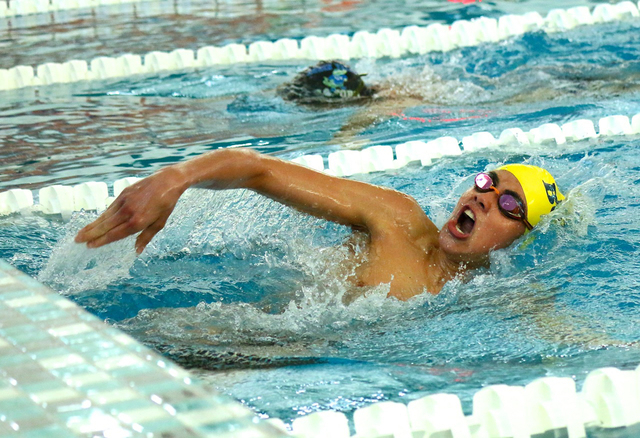 On March 24, the boys and girls swim teams had dual meets against Del Sol. Both won, with the girls topping Del Sol 208 to 52, and the boys scoring 185 to 69. Boulder City topped every category. Swim coach Sara Carroll said the boys team had a lot of absences, but after spring break she is expecting her team to be at full strength. At the meet, the Eagles showed strength in every event presented to them. In the 200-yard medley relay, Boulder City’s A teams recorded the best times in both categories. The girls team — Mandy Gebhart, Alex Hubel, Montana Lloyd and Abby Sauerbrei — recorded a time of 1:53.03. The fastest relay team for Del Sol was 3:07.34. The boys team finished with a time of 1:56.82. Relay swimmers were Braden Klouse, Nick Lara, Lars Palmer and Clayton Pendleton. The Eagles also won the 200-yard freestyle in the girls and boys races. Lloyd and Purdy took the top two spots, with times of 1:57.06 and 2:07.53, respectively. Klouse and Monte Morris claimed the top spots, finishing 1:56.34 and 2:08.10, respectively. Hubel recorded the fastest time in girls 200-yard individual medley, with a time of 2:12.00, while Lara topped the boys category, finishing 2:04.84. Boulder City claimed the top spots in the girls and boys 50-yard freestyle. Sauerbrei finished with a time of 25.94, and Mackenzie Cummings with 28.96. Pendleton recorded a time of 26.44. Gebhart finished first in the girls 100-yard freestyle, recording a time of 55.78, and Klouse recorded a time of 53.71, finishing first in the boys category. In the girls and boys 500-yard freestyle, Hubel recorded a winning time of 5:08.74, and Monte finished first with a time of 6:03.27. The Eagles outswam Del Sol in the boys and girls 200-yard freestyle relay, and had the best times for the girls and boys 100-yard backstroke. Aubrey Klouse recorded a time of 1:07.19 and Lars Palmer finished at 1:05.48. Alexis Stebbens and Tara Spinkelink brought in the best times for Boulder City in the girls 100-yard breaststroke, recording times of 1:22.69 and 1:28.90, respectively. Pendleton recorded a time of 1:21.29, with teammate Tyler Hinson finishing with 1:21.65. The Eagles finished the last event on top, with both A teams recording the fastest times for the 400-yard freestyle relay. The girls team recorded a time of 3:50.88 and the boys 3:52.65. Boulder City has a brief break, then comes back April 18 versus Virgin Valley.